We recently found ourselves in a difficult situation. We had sent a Sound Shark to a writer in Canada for him to review. Unfortunately, problems with tariffs and taxes stranded the demo unit in Canada. If no one was willing to pay the outrageous fees, we were told the Sound Shark would be discarded. With the unit “trapped” in Canada, we decided to ask a customer of ours if he was interested in testing the Sound Shark. 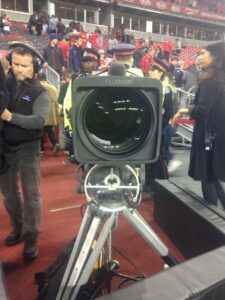 Steve is a professional audio engineer that was instrumental in getting the Canadian television networks to use our Klover MiK 26 parabolic microphones. To our delight Steve didn’t just conduct some simple tests at home, he brought it to work. 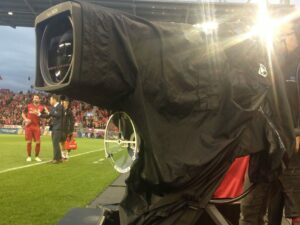 He mounted the Sound Shark to a television camera lens at a professional soccer game. “I pulled the parabolic out of the box yesterday and instantly had a ton of interest from some of the crew. My tech manager loved it. He wants one for his DSLR. He came in during the game and listened in real time. I’m sure he’ll be ordering one soon. I’ve attached some pics of where I mounted it. Thought it was pretty ingenious. Steve ended up selling the Sound Shark to his technical manager and purchased a Klover MiK 09 (the broadcast version of the Sound Shark) for himself. The Klover MiK version has a more robust microphone mount so Steve doesn’t have to worry about his focus point shifting when the unit takes the bumps and thumps of the broadcast world. Free Pass To NAB 2018! Can you use a shotgun mic in a parabolic microphone?